Before there was Ukraine, Russia, or the Soviet Union, there was Kievan Rus’. 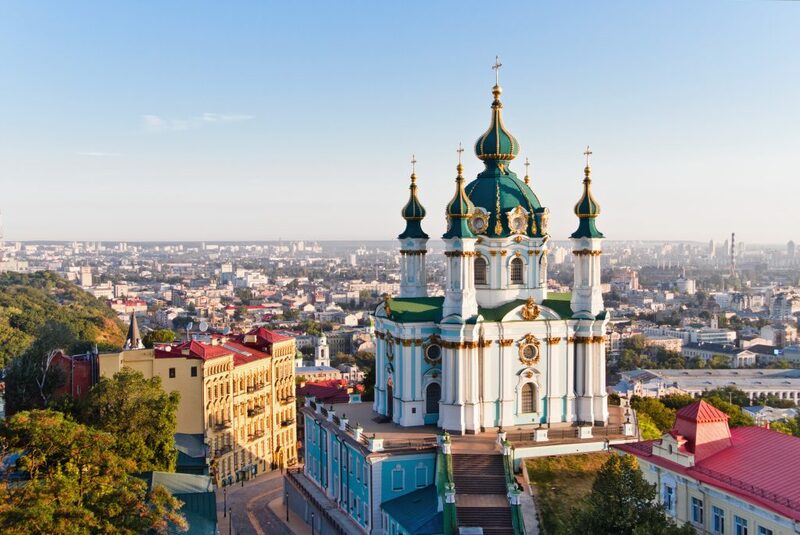 One of the oldest cities in Eastern Europe and the birthplace of much of Slavic ancestry, Ukraine’s capital of Kiev is a fascinating whirlwind through ancient and modern history. Situated on the banks of the Dnieper River, Kiev wears its long, complex, and often fraught history on its sleeve. Cathedrals dating back to the 11th century contrast with Soviet block apartments and modern architecture that could be appropriately termed “post-communist swagger.” Old cafes decorated with wood carvings where babushki drink berry tea are neighbored by trendy Georgian restaurants frequented by start-up employees. Whimsical animal statues and colorful buildings line cobblestone streets – a quaintness and charm that would seem entirely pure if it weren’t for the persistence of politically-charged graffiti and placards. Frequently occupied by foreign powers over the last millennium, from Mongols to Soviets to Nazis to the Kremlin, the Kiev of today is fiercely determined to prove itself as an independent and modern culture-hub. 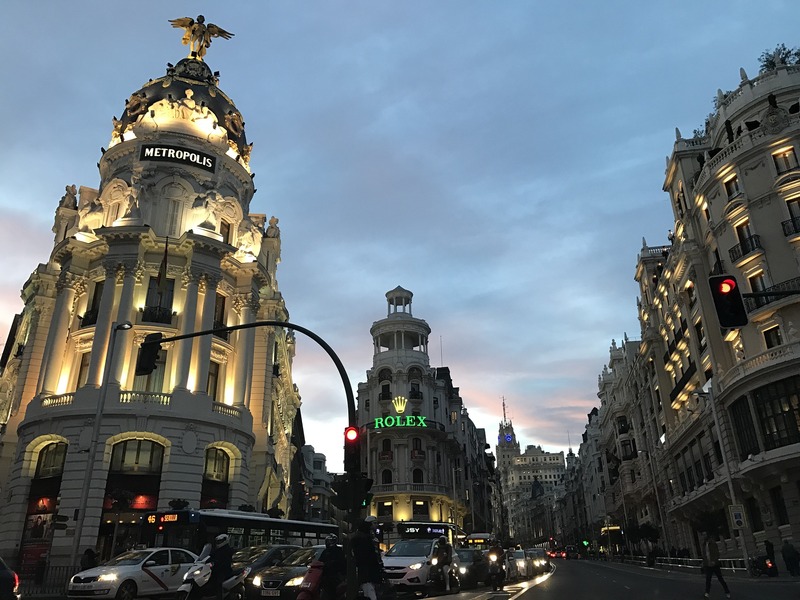 Having hosted the Euros in 2012 and set to host the 2018 Champions League Final, welcoming travelers for major sporting events is one of the ways this city of 3 million is drawing international interest and tourism. As one of eastern Europe’s oldest cities, Kiev has no shortage of gorgeous Eastern Orthodox cathedrals. 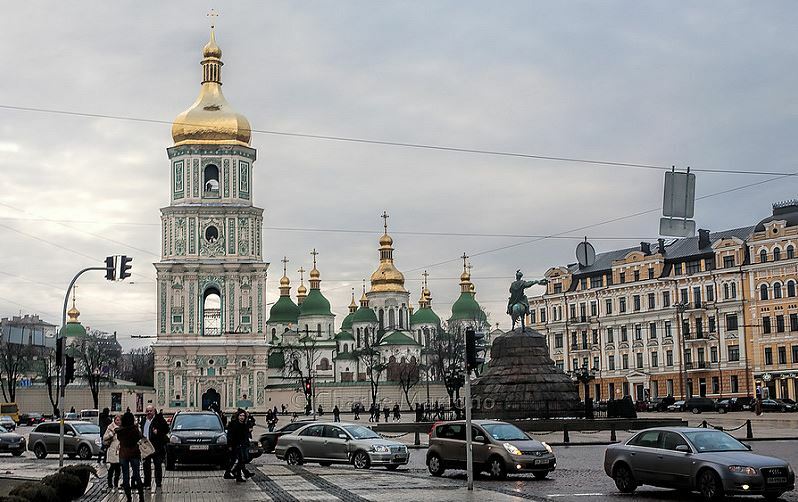 If you only make it inside one cathedral during your visit to Kiev, make it Saint Sophia’s, located just north west of the city center on an expansive open square. Saint Sophia’s Cathedral is over 1,000 years old and was one of the most important centers of worship during the time of Kievan Rus’. A Unesco Heritage site, this cathedral is pictured on the 2 Hyrvni note (the Ukrainian currency). Photos aren’t permitted inside the cathedral to preserve the ancient painted icons. But make sure you make it to the top of the Saint Sophia’s bell tower, and bring your camera! You’ll have a fabulous view of the city. 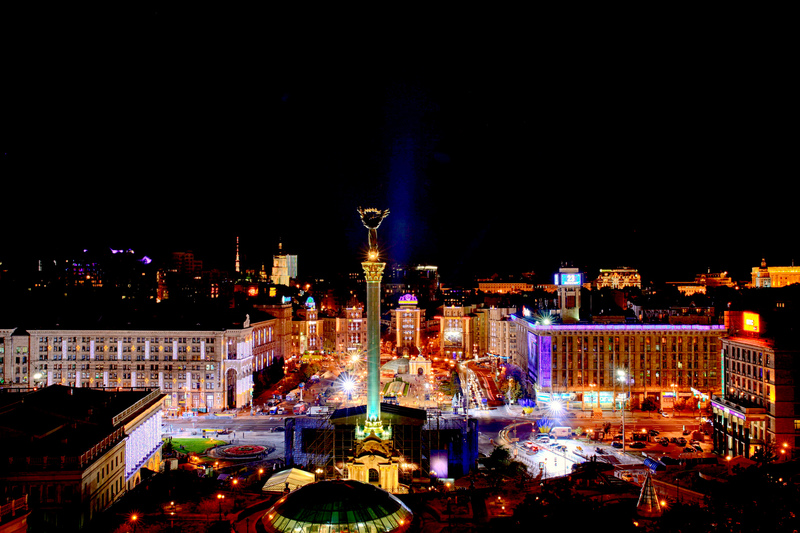 The view of the surrounding area and downtown Kiev from St Sophia’s Bell Tower (Source). Other beautiful cathedrals in Kiev include the Pechersko-Lavra (which includes underground caves, tombs, and mummified monks as well as a gorgeous view of the Dnieper) and St. Andrew’s Church (a brilliant gold and blue cathedral perched a top a hill among winding cobblestone streets lined with art sellers, flea markets, and colorful buildings that remind one of Paris’ Montmarte district). If museums sound to you like cold, boring buildings where crowds move lethargically from installation to installation completely forbidden from touching anything, Kiev will turn this concept on its head. 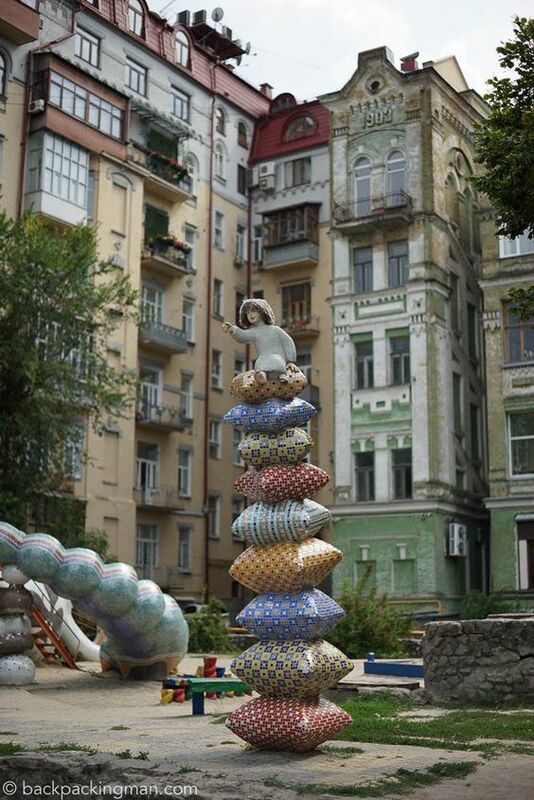 Kiev offers a diverse array of museums, many of which offer immersive experiences. Though the site of the infamous Chernobyl nuclear disaster is a good two hour drive from Kiev, a national museum for the disaster is located in Kiev. As visually stunning as it is deeply disturbing, the museum displays classified documents, unique artifacts, photographs, and recreated sets related to the 1986 disaster that has rendered an 18 sq mi area uninhabitable for humans for the next 20,000 years. With fascinating exhibitions about the human and ecological impact of the explosion and following radiation, the Chernobyl museum will give you a haunting glimpse into one of the worst disasters in human history. The Ukrainian National Chernobyl Museum in Kiev. One of the most beloved authors of Ukraine, Mikhail Bulgakov was born in Kiev in 1841. His most famous novel, The Master and Margarita, a fantastical, scathing, and delightful satire of Soviet life, could only be published posthumously due to state censorship. Bulgakov’s childhood home in Kiev has been converted into a museum as wild and creative as his imagination. 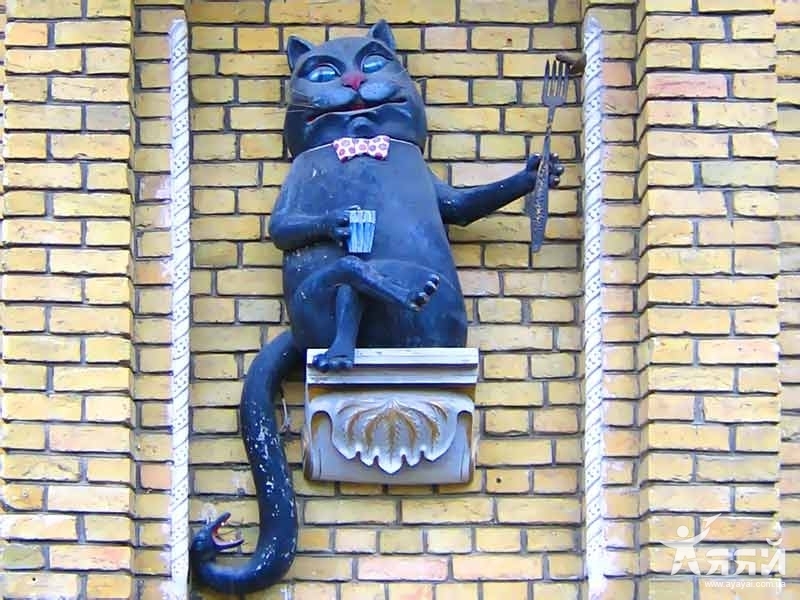 The museum is inhabited by the magical characters of the novel, like Behemoth, a giant cat with a dirty mouth and penchant for vodka, and, rumor has it, the Devil himself. 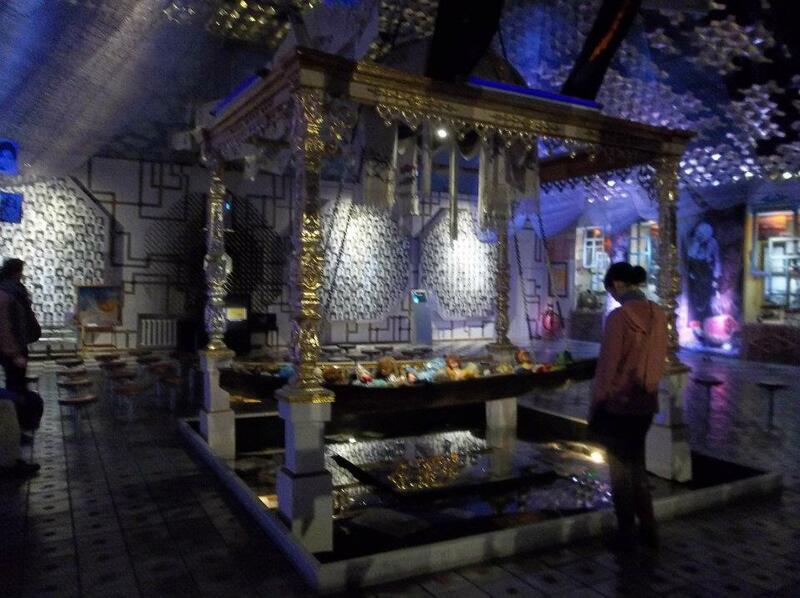 Furniture moves on its own, mirrors suddenly become transparent, and at the end of the tour you are treated to candlelit tea time with an assortment of jams and breads. 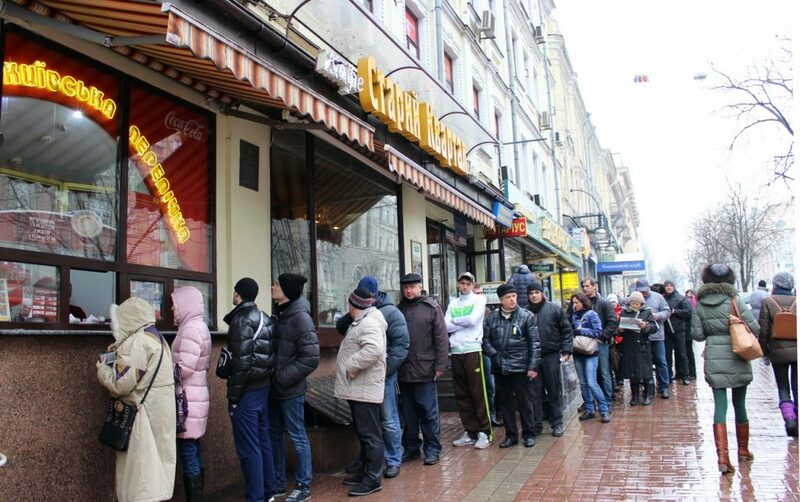 Even in the dead of winter, locals and tourists alike line up at Kyivska Perepichka, an unassuming window front out of which two women hand out sausage wrapped in freshly fried dough. If that sounds underwhelming to you, simply walking by and catching a whiff of what is popularly considered the best street food in Ukraine will be enough to change your mind. For a sit-down meal and a taste of Ukrainian hospitality, head to Varenichnaya No. 1. 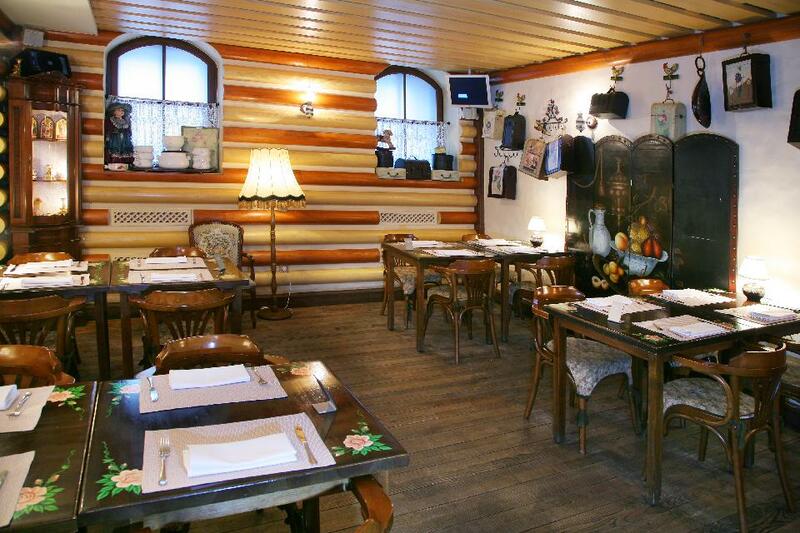 Decorated with an old-timey interior and featuring all of the Ukrainian national dishes including borsch, salo, and 30 varieties of dumplings stuffed with everything from cherry jam to liver, Varenichnaya No. 1 offers the full range of traditional Ukrainian village cooking. Plus, they keep a live baby pig on site by the front door to greet guests. Kiev nightlife offers a bit of everything, from techno-house dance parties in abandoned office blocks to elite cocktail lounges to latin-themed clubs with dancers and tiki drinks. For a rave or techno party, check out where some of Kiev’s up-and-coming DJs are playing on any given night. For VIP service and rooftop views of the Kiev skyline, head to the b-hush Rooftop Lounge. For live music and umbrella drinks, the Caribbean Club offers a great time. 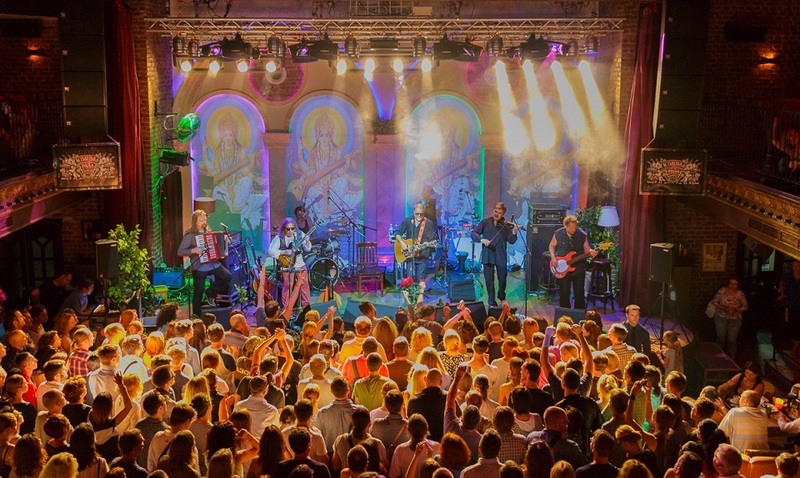 Kiev nightlife is colorful, filled with underground vibes, and worlds cheaper than its counterparts in Moscow or Berlin. But make sure you dress to impress! Ukrainians take care to look sharp, especially for a night out. While the eastern borders of Ukraine are highly militarized and plagued with fighting, hundreds of miles away life in the capital city continues peacefully. There is no denying that Ukraine is at war, and their long and difficulty history with Russia is not likely to be resolved soon or with ease. But Western tourists are highly unlikely to stumble into any dangerous situations in Kiev related to this war. Furthermore, they are unlikely to even encounter radical views in Kiev. 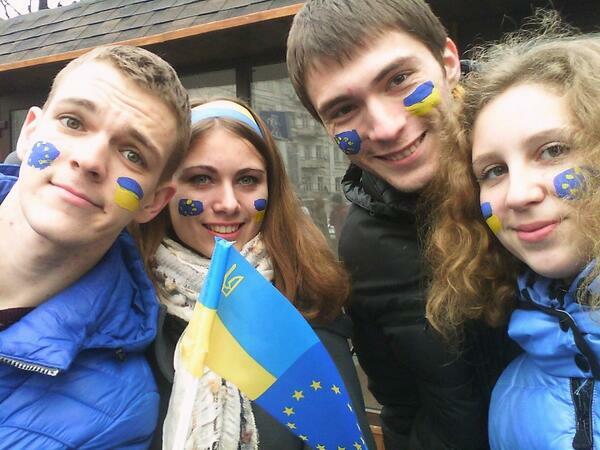 As the capital city, a university town, and the country’s favorite locale for young people, an overwhelming majority Kievans hold the opinion that Ukraine should have closer ties with the European Union. Political demonstrations may take place and there will be plenty of political literature and graffiti around the city, but Kiev remains on the whole peaceful. Aside from the war with Russia, safe travel in Kiev is not much different from safe travel in any other second-world country. Tourists in crowded areas may be at a slightly higher risk to be targeted by petty thieves and scammers, but keeping vigilant will prevent these scenarios. Low-level corruption may be visible to tourists, but they are very unlikely to be the targets of it. Though Kiev tends to be more socially liberal and diverse than the rest of the country, LGBT persons and individuals of African or Middle Eastern descent may encounter stares or hate speech. But visitors who are clearly tourists and are surrounded by supportive peers are extremely unlikely to be the targets of violence. On the whole, Kievans are friendly, progressive, and think favorably of American and Western Culture. While English proficiency in Kiev is considerably lower than that of Western Europe, English is commonly studied as a second language through high school if not on into college. Groups of students are a good bet to approach should you find yourself needing directions or help in English – it’s likely that they will know enough to have a basic conversation with you. Many western visitors are surprised to find that, upon visiting Kiev, its Soviet era metro system is at once beautiful, clean, and highly efficient. Featuring three lines and 52 stations and transporting 1.3 million passengers daily, the Kiev Metro is a pleasant and reliable way to get around the city and to and from its outskirts. The Kiev Metro also boasts the deepest station in the world, Arsenalna, which is 364 ft deep and takes 5 minutes on the escalator. 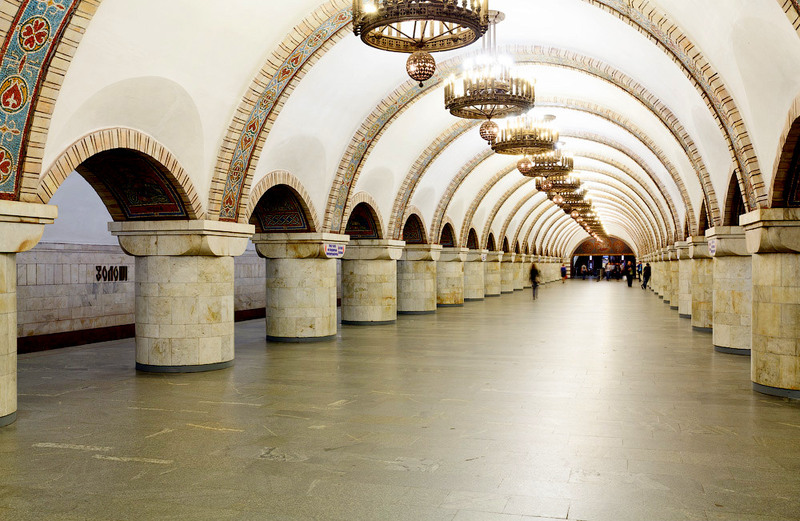 Underground palace or a Kiev Metro station? (Source). One of eastern Europe’s friendliest and most fascinating cities, Kiev is a must for every travel bucket list. Want to watch a premier international sporting event in this colorful city with plenty of opportunity to explore your surroundings? 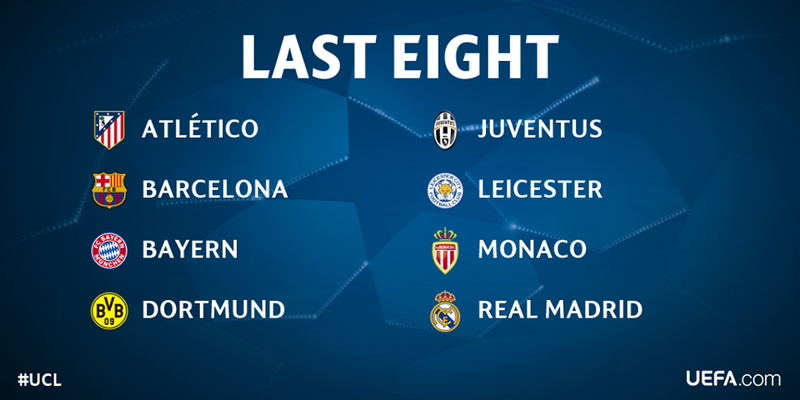 Book your trip to the 2018 UEFA Champion’s League Final in Kiev today.